I was approached by a customer to make something for his friends 60th birthday. He works on boats, and he wanted me to incorporate that in the theme. The only spec he gave me was that he wanted a 6″ blade. 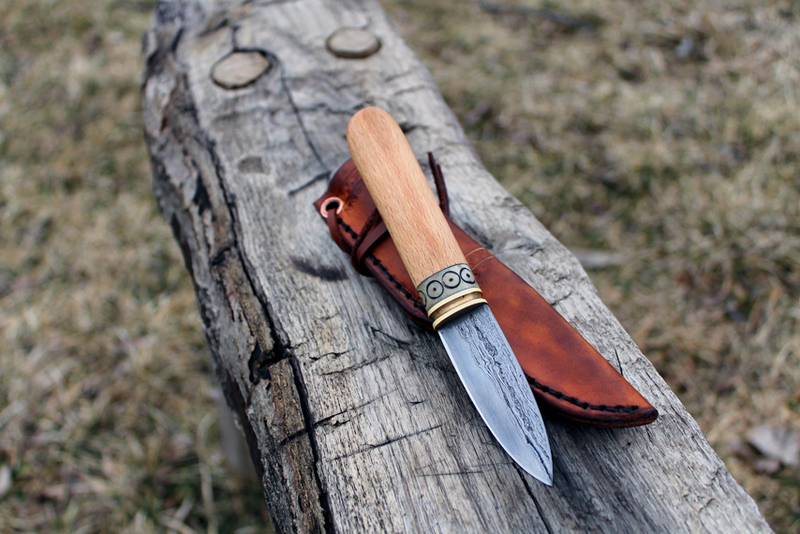 The handle is diver salvaged flame birch from Superior, antler with a very modest bit of scrimshaw, and anchor chain for the bolster. I really like being able to give people something special that will most likely be passed down generation to generation. 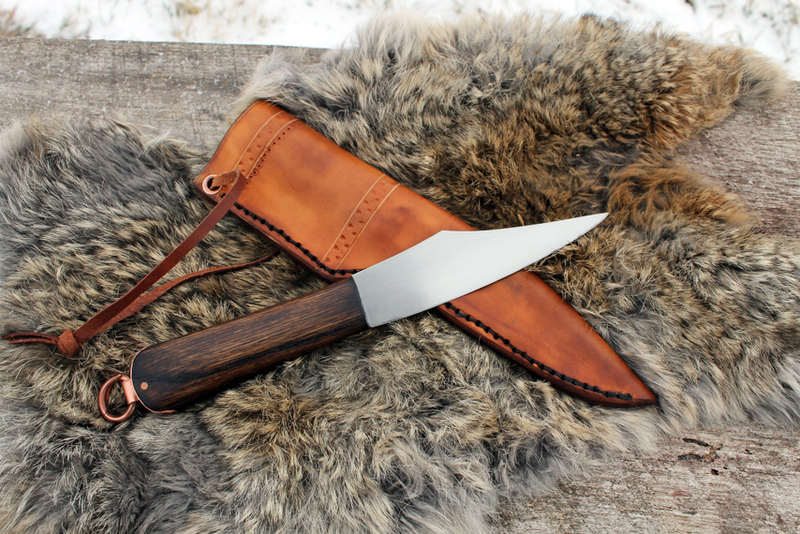 I’m a big fan of simple, well made things, and knives are no exception. 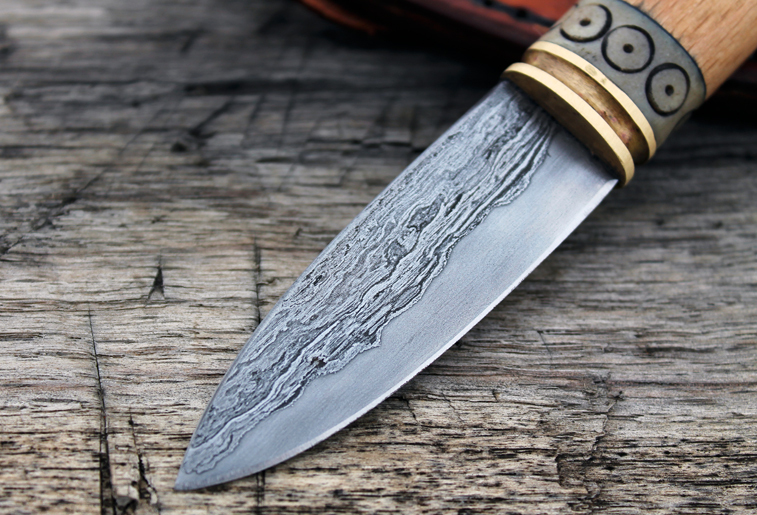 I have the utmost respect for bladesmiths who spend so much time with carvings, scrimshaw, and inlays in their work, but for me at this point in time, that’s just not how I express my idea of a knife to the world. 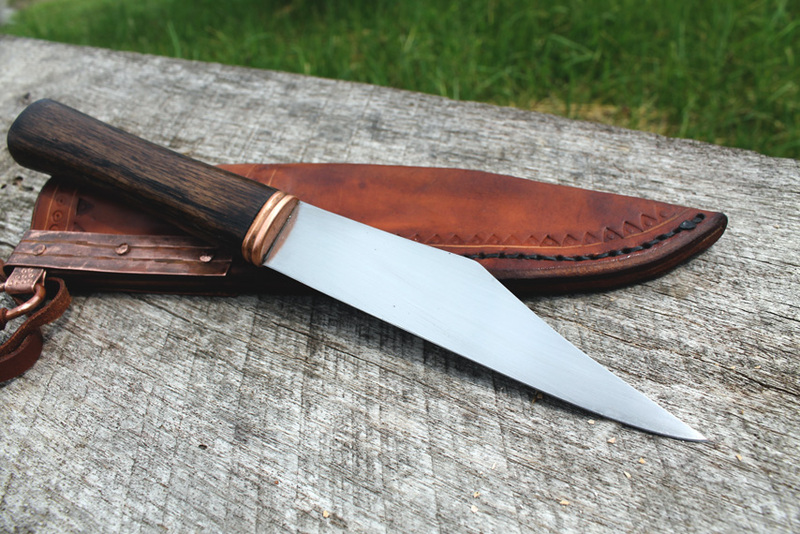 I’m also a huge fan of small knives, which I think at this point is rather obvious to anyone looking at my work. 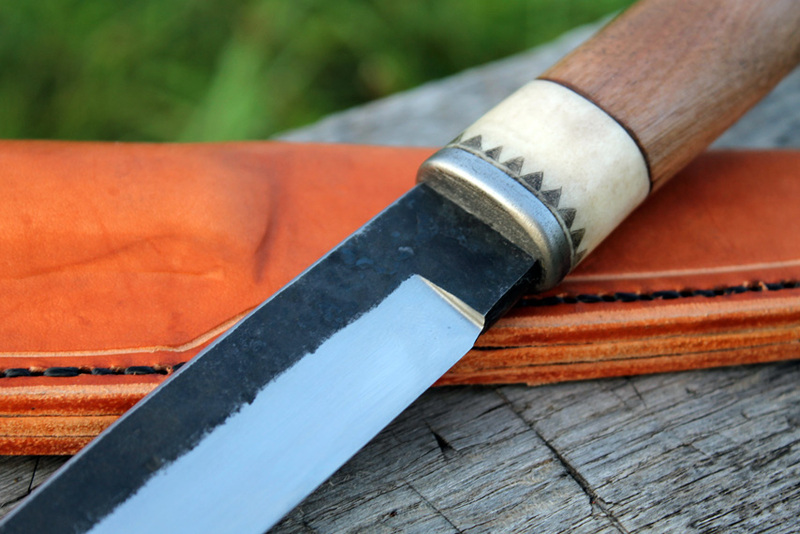 The old timers say that the better you are with a knife, the smaller your knife generally is. 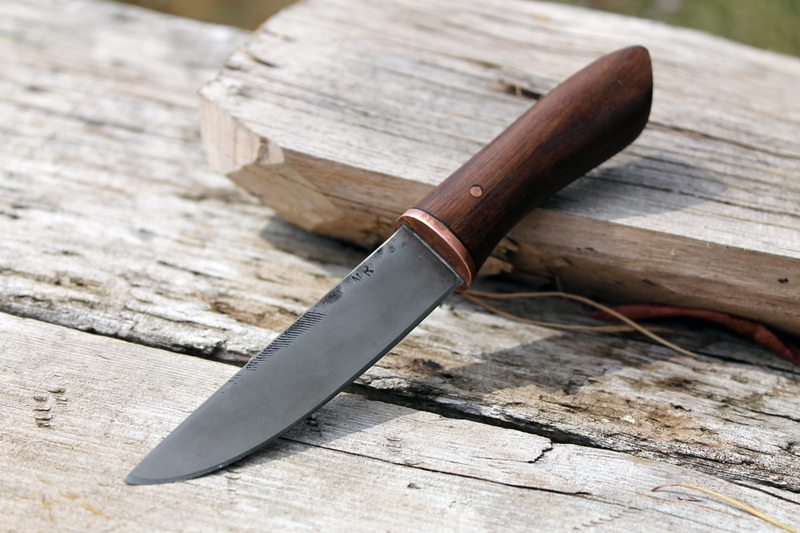 The knife I carry around on a daily basis has a 2 1/2″ blade and a very simple lilac handle. 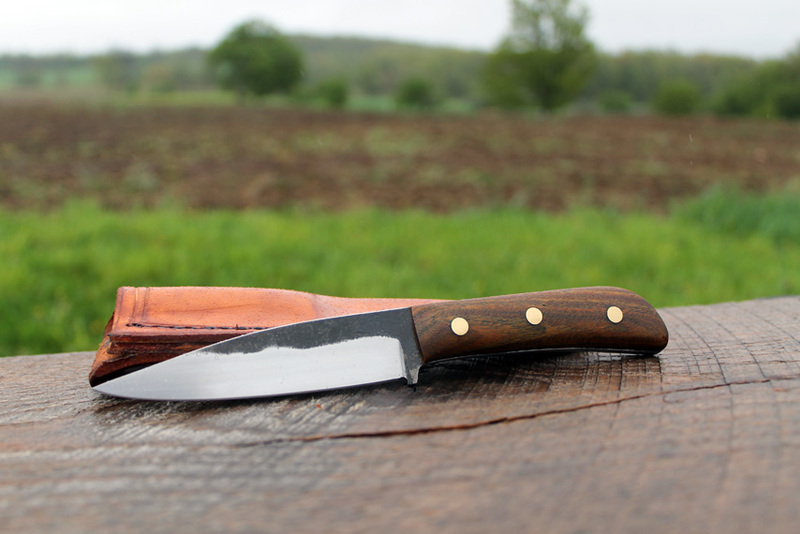 I’m not saying I’m good with a knife, just that my preference is for smaller blades. 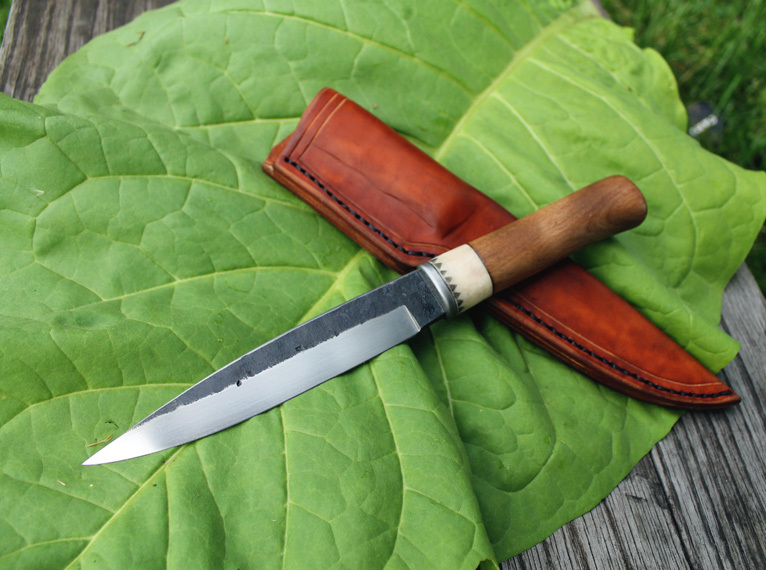 Now there are plenty of folks who use larger knives and are excellent with them, my point isn’t to say one knife is better than the next… that’s stupid. 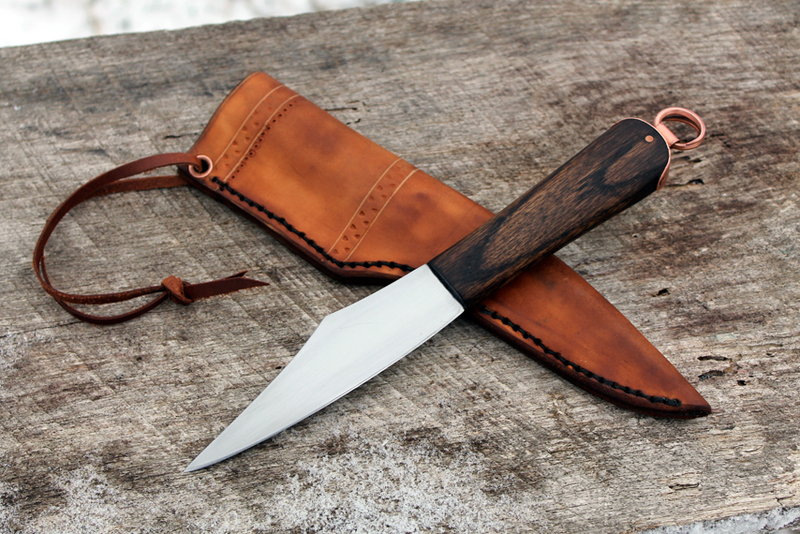 So here are some knives I’ve been working on, simple little guys for the most part. 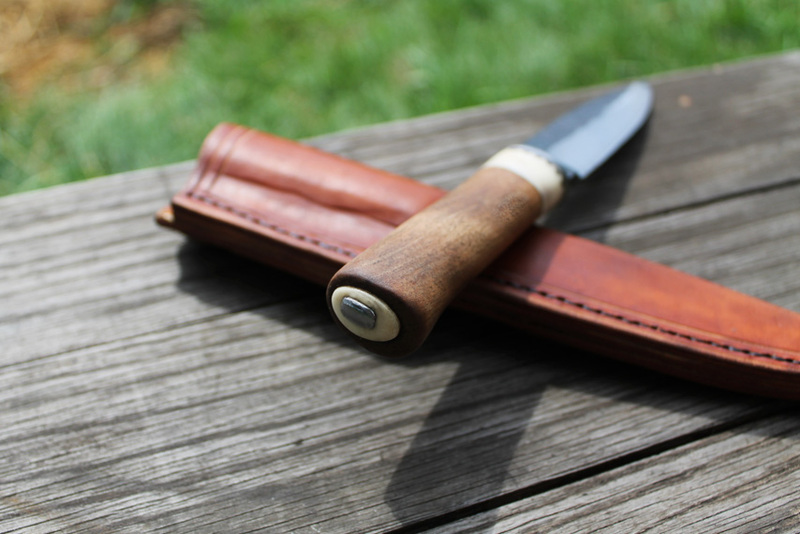 1084, Walnut, and Italian Briar for the bolster. 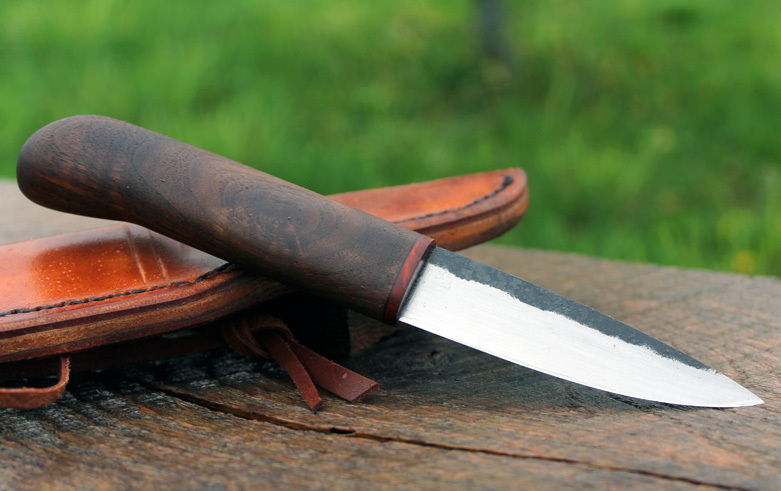 Some of these knives are for sale at my etsy shop. Other are already sold. 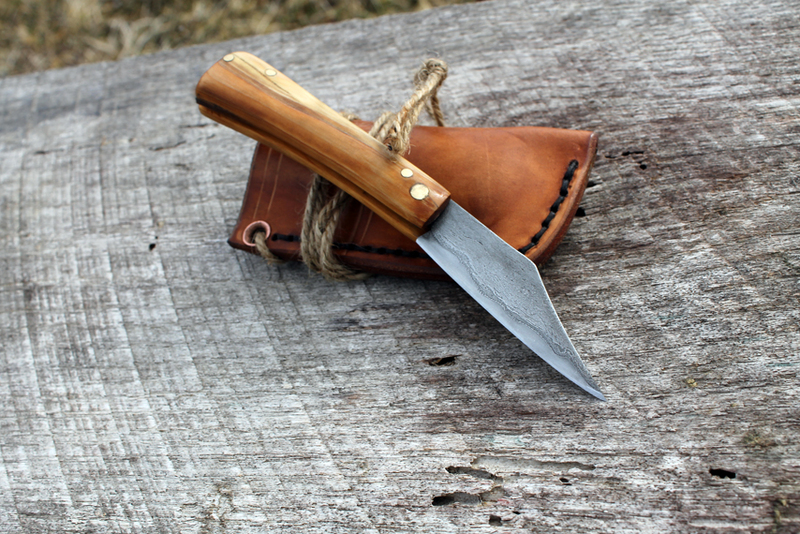 Here is a small little knife I made for a friend. It is a simple design that isn’t based off of anything other than my own thoughts. 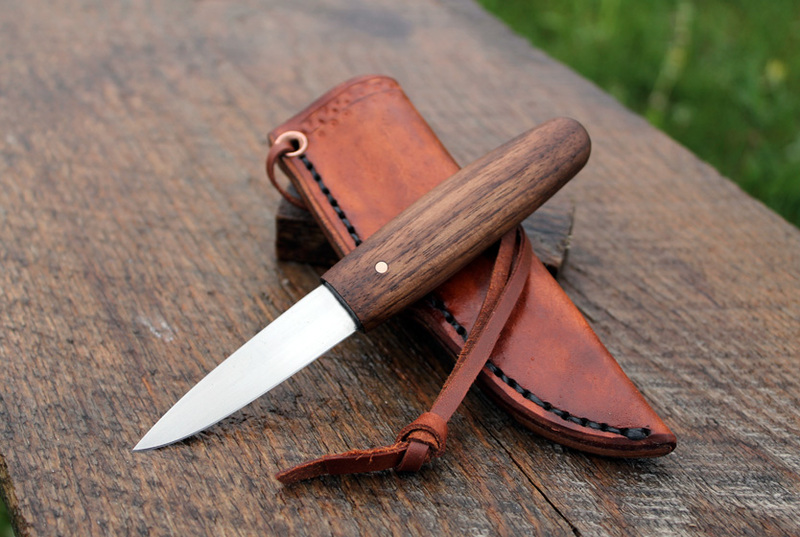 It’s intended to be a useful knife that is also nice to look at. 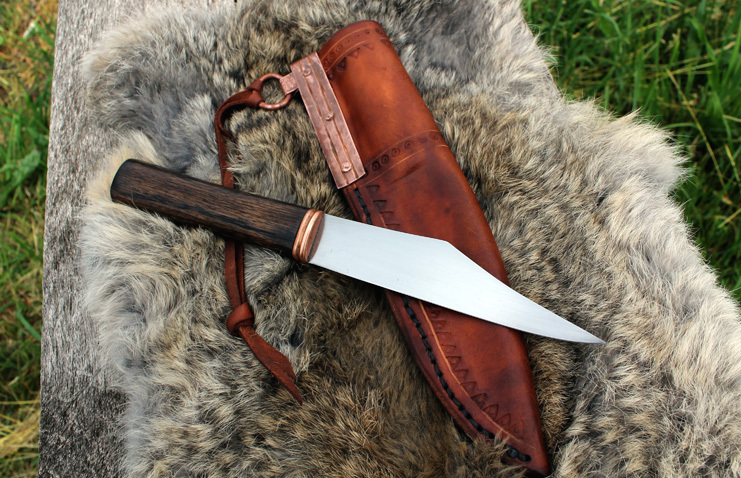 The blade is wrought iron/1084. 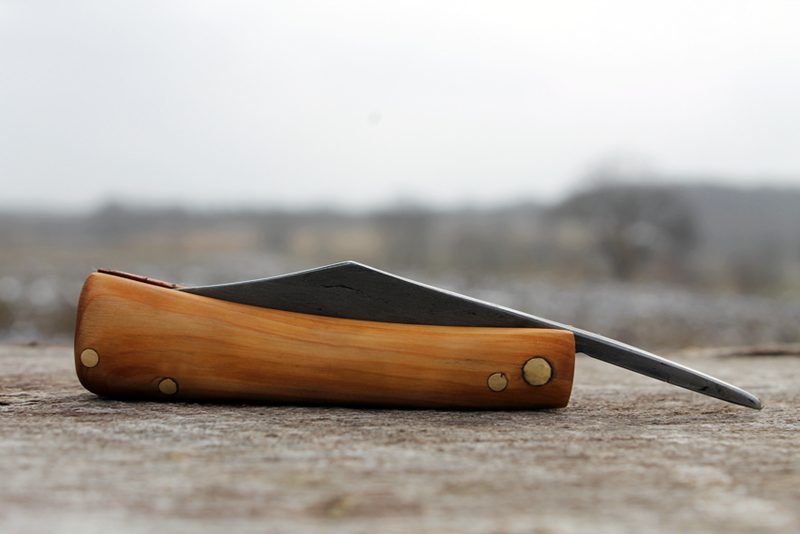 The handle is beechwood, antler, and brass. 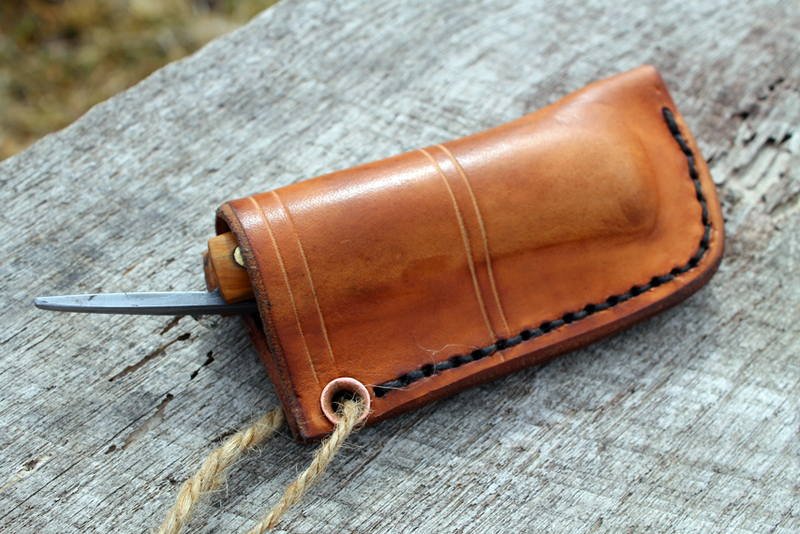 The sheath is vegetable tanned cow leather. 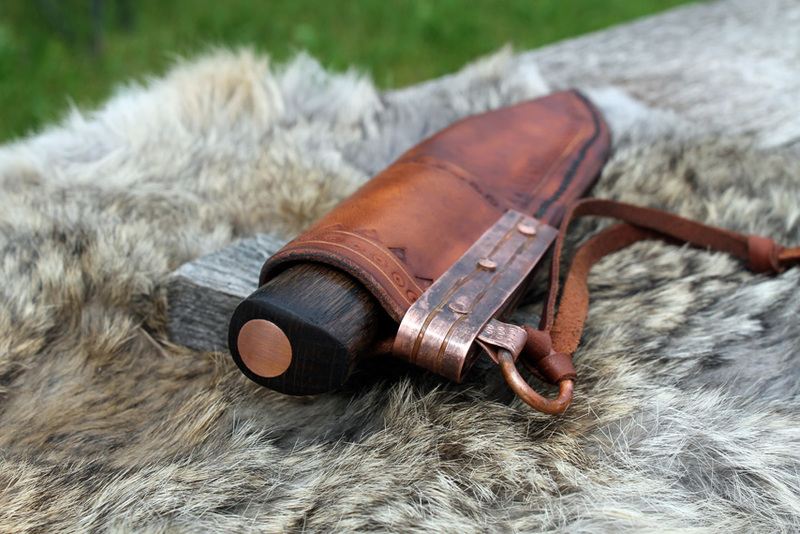 One of my wonderful repeat customers asked me to make him a Viking style every day sort of knife that he could use for small game hunting, eating, and camping. I decided not to follow a strict historical pattern, rather I was influenced by many different archeological finds and my own imagination. I wanted a relatively simple design with little adornment, and a traditional look. 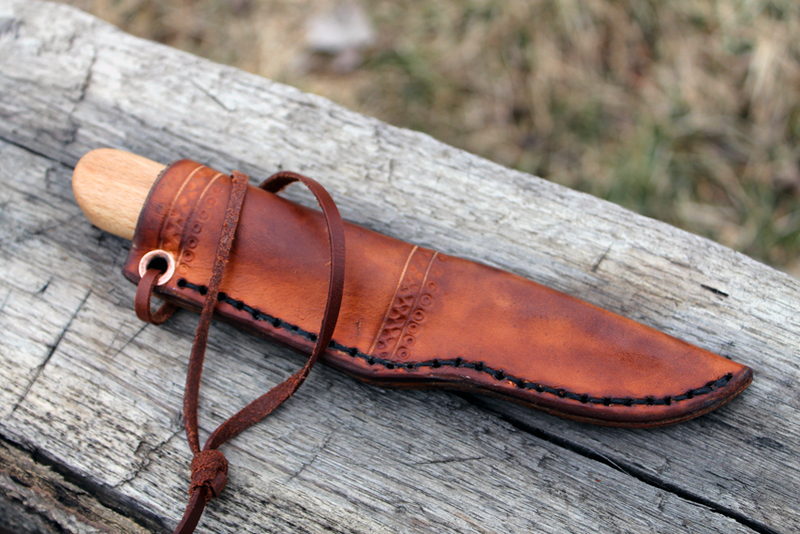 This type of sheath holds the knife very tightly. 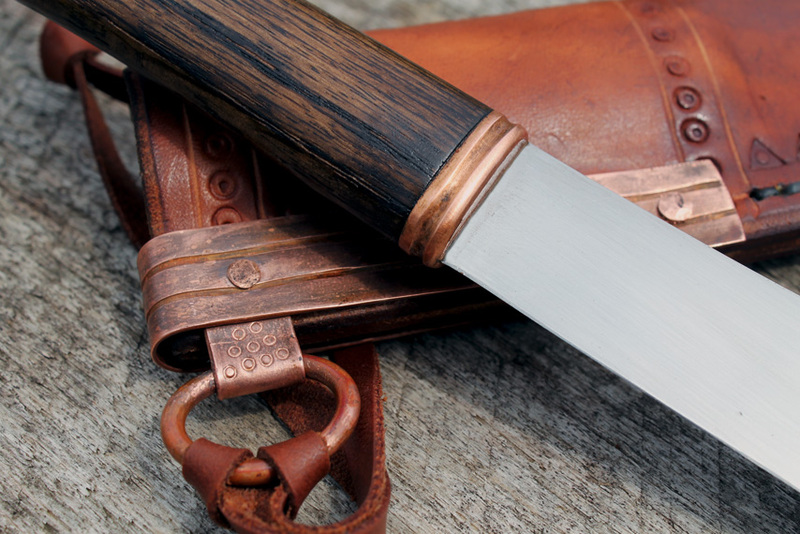 To make it easier to draw out, a copper ring is added onto the back of the knife. 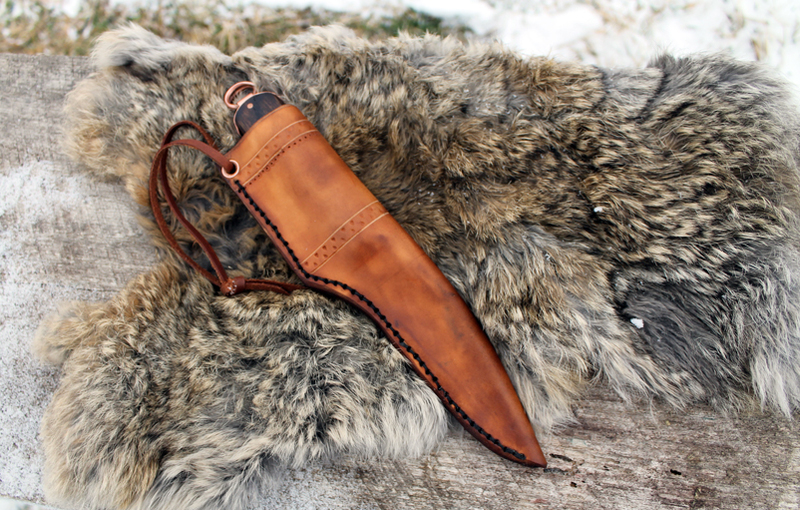 Finally a sheath is made of thick vegetable tanned leather. 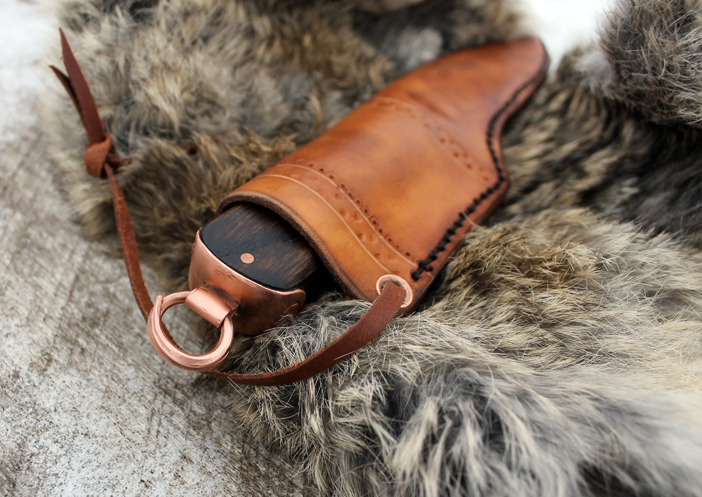 It is coated in beeswax and has a leather hanger. 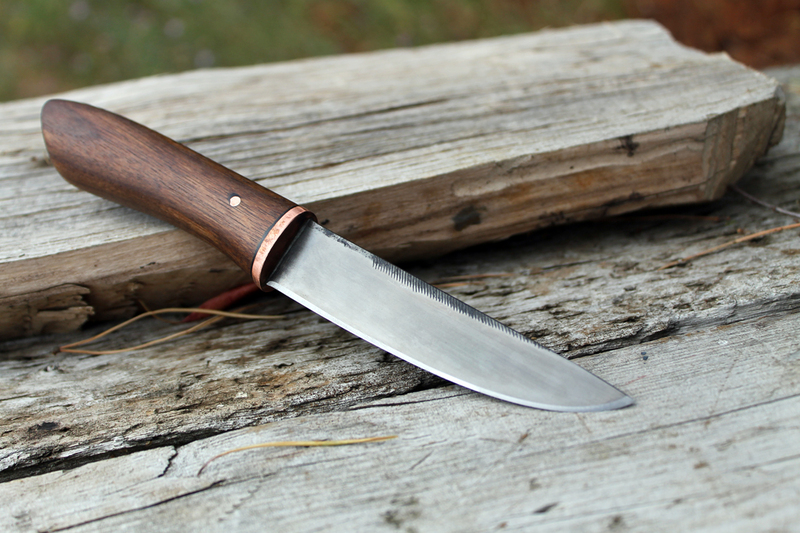 New knife of repurposed materials. 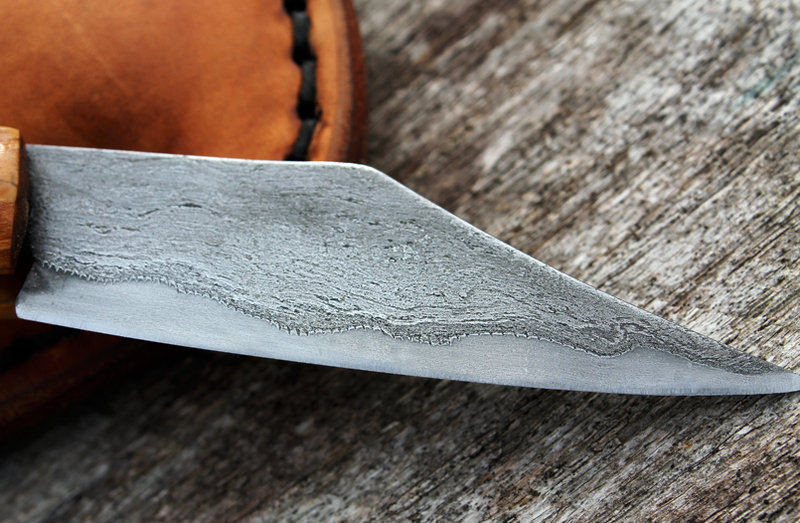 I generally use new materials on all my knives, especially for the blades. 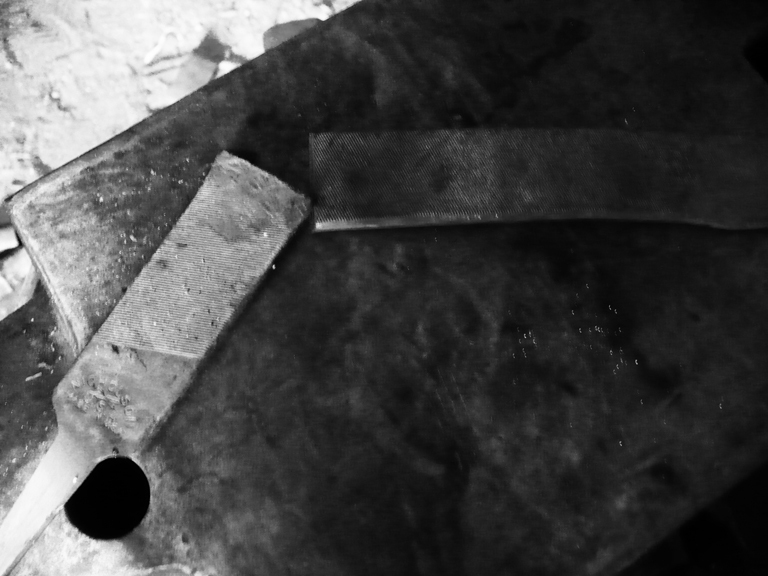 With a lot of used materials there is no telling what it’s really made of (metallurgically speaking) so it can be difficult to get the best heat treat out of the steel. 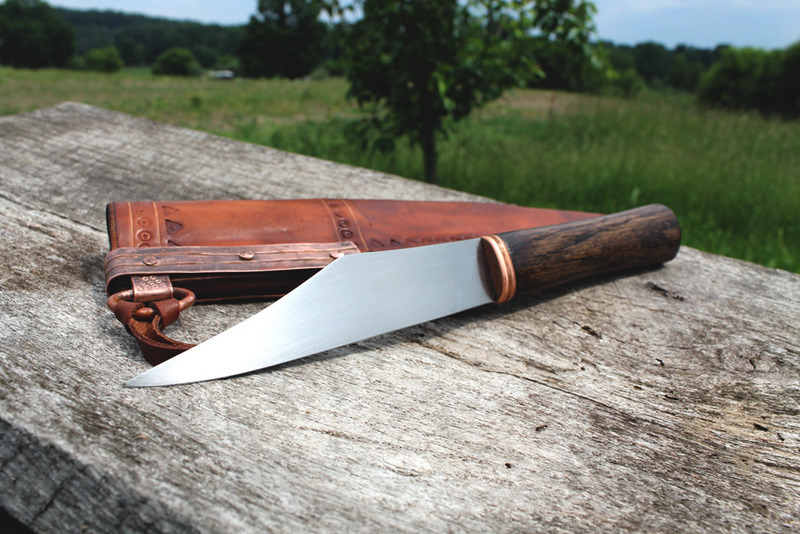 When I sell a knife I like to have peace of mind, and know how it will preform over long term use. 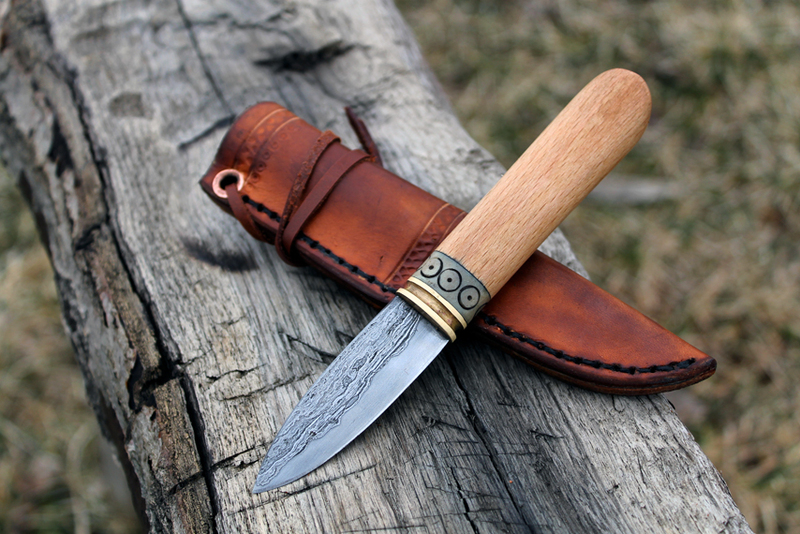 There are some things that I love to repurpose for blades though, and good quality files are among my favorites. 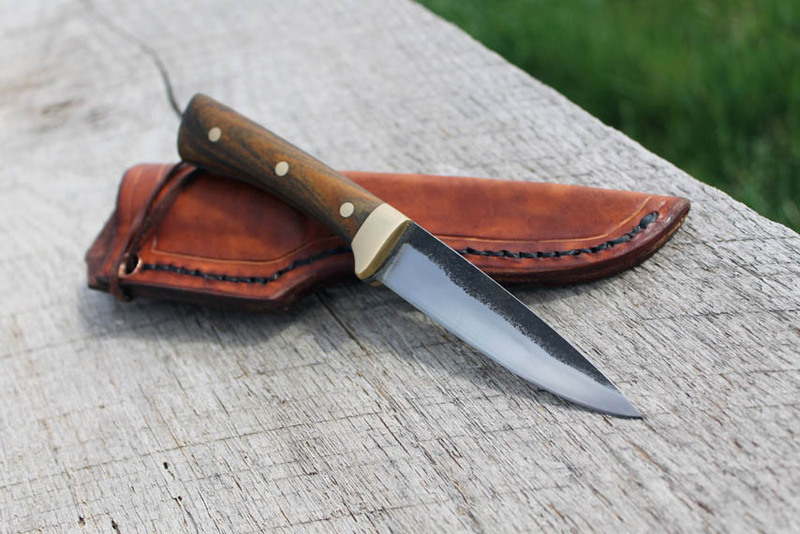 This blade is made from an old Nicholson file that was dulled beyond use for much of anything, however it makes a wonderful knife! 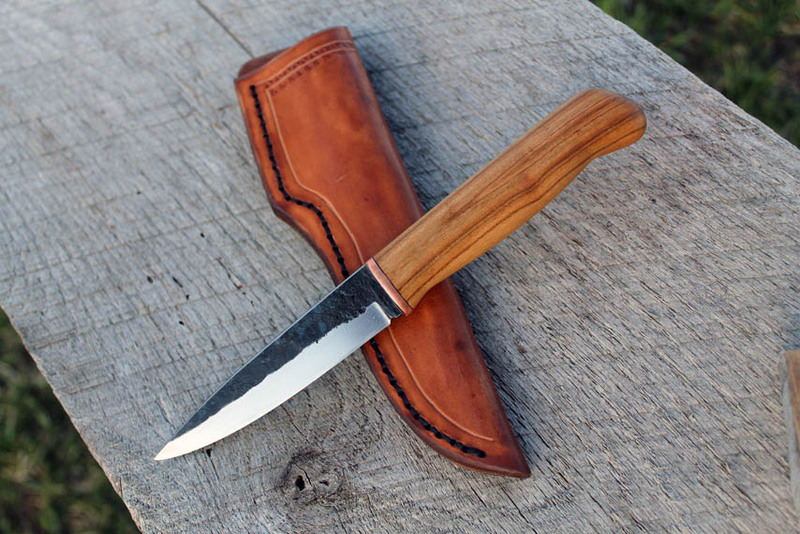 The handle is a black walnut cutoff from a local wood worker that I know Chris Otto. 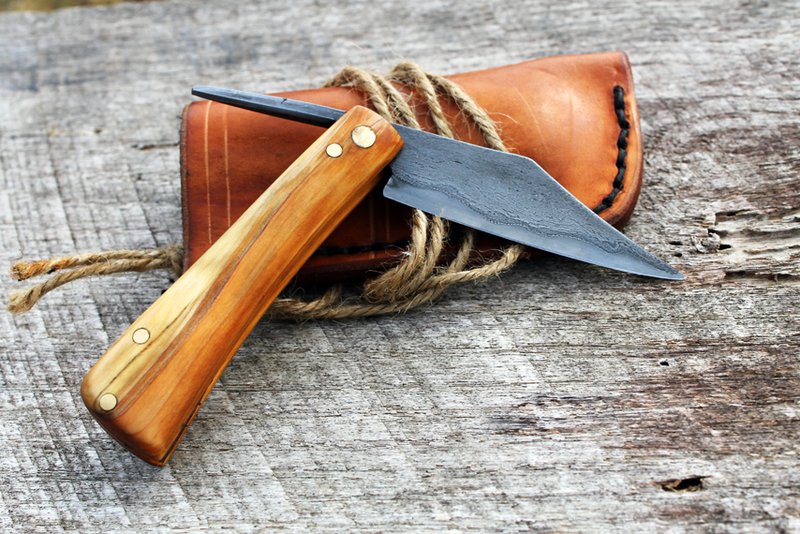 The blade is 4″, and is very handy for all sorts of different tasks. 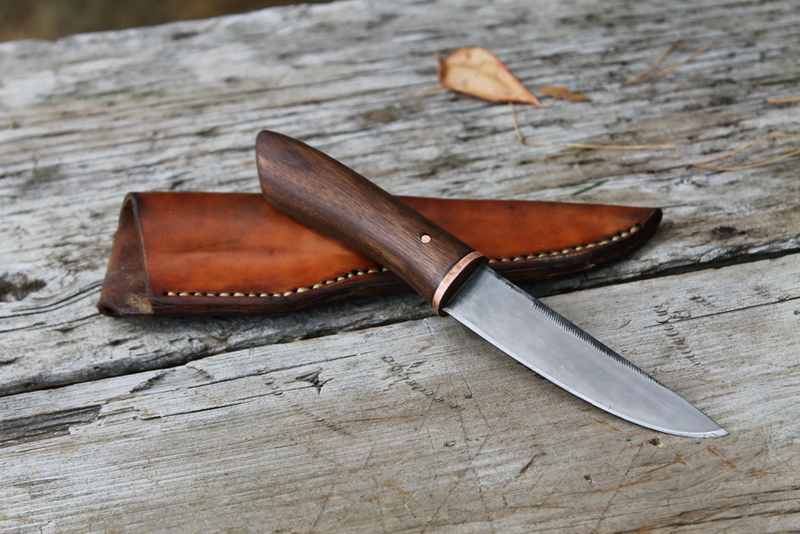 This knife is for sale at my etsy store.